Providing auxiliary hydrogen power to docked or anchored ships may soon be added to the list of ways in which hydrogen fuel cells can provide efficient, emissions-free energy. Hydrogen fuel cells are already powering mobile lighting systems, forklifts, emergency backup systems and light-duty trucks, among other applications. Now, researchers at Sandia National Laboratories have found that hydrogen fuel cells may be both technically feasible and commercially attractive as a clean, quiet and efficient power source for ships at berth, replacing on-board diesel generators. The Sandia study was completed for the U.S. Department of Energy’s Office of Energy Efficiency and Renewable Energy (EERE). Auxiliary power to docked ships, usually provided by on-board diesel engines, is a significant source of greenhouse gas emissions and air pollution, accounting for one-third to one-half of the in-port emissions attributed to ocean-going vessels. According to a 2004 study by the Natural Resources Defense Council, average daily emissions for a busy port could exceed the total emissions from nearly 500,000 vehicles. The study evaluated a simple fuel cell strategy that consists of mounting a hydrogen-fueled proton exchange membrane (PEM) fuel cell on a floating barge. Supplying a container ship with average power and run times (1.4 megawatts over 48 hours) requires four 40-ft containers, two for the fuel cell and two for hydrogen fuel storage, which could readily fit on a typical flat-top barge. For ships requiring less power, such as tugboats, a single container housing both the fuel cell and hydrogen will suffice, according to the Sandia study. To evaluate the feasibility of the fuel cell barge strategy and analyze potential deployment options, Sandia’s Joe Pratt visited ports up and down the West Coast and in Hawaii. He gathered data from two U.S. Department of Transportation Maritime Administration facilities and the ports of Long Beach, Calif., Los Angeles, Calif., Oakland, Calif., Portland, Ore., Tacoma, Wash., Honolulu, Hawaii and Seattle, Wash.
“While Sandia has previously examined the potential for hydrogen and fuel cells in other applications, this is the first study of a maritime environment,” Pratt said. A common alternative to auxiliary diesel engines is a practice called “cold-ironing,” in which a vessel at berth connects to a source of electricity on the shore. (The engine, made of steel or iron, literally becomes cold, hence the name.) Electricity supplied by a hydrogen fuel cell thus could become a new form of cold-ironing. The U.S. Navy has been employing grid-based cold-ironing for many years to save fuel. 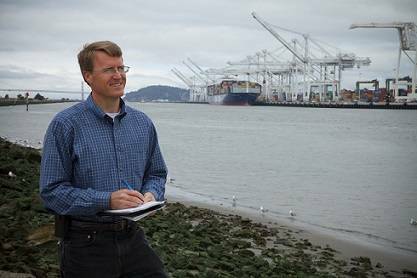 Ports in California are now turning to the practice to meet the state’s environmental regulations. While only a few berths have grid-based cold-ironing, ports throughout California are installing infrastructure to meet the state Air Resources Board’s regulations that take effect in 2014. But grid-based cold-ironing is complex and costly, and most ports lack the infrastructure needed to meet the power needs of multiple ships at berth. Those costs can run up to $5-10 million or more per berth, said Pratt. The Port of Oakland is installing 11 berths on six terminals at an estimated cost of about $70 million. In addition, switching to grid-based power doesn’t eliminate emissions. Instead, that approach shifts the emissions to the source of electricity. Depending on the electricity source, the overall reduction in emissions can be relatively small. At ports in Oregon and Washington, grid-based cold ironing infrastructure is limited or nonexistent. Using a hydrogen fuel cell to power container ships at berth has attracted interest for its potential economic and environmental benefits, Pratt said, and he continues to work with those ports on quantifying the benefits and deployment options. “You can replace the diesel generator with a hydrogen fuel cell without changing the operations. It’s just a power source in a box, a shipping container in this case,” said Pratt. Hawaii ports aren’t facing the same emissions regulations as California ports, but the potential savings in fuel cost is attractive for the company operating the inter-island transportation service, along with anyone else suffering from high fuel expenses. The study’s basic fuel cost analysis showed that at today’s prices hydrogen, at about $4 per kilogram, with a fuel cell is cost-competitive with maritime fuels using a combustion engine. Subsequent analysis has shown that when generators are frequently producing less than maximum power, such as in the Hawaii application, the efficiency advantage of fuel cells compared to the combustion engine is widened. Even hydrogen at $5 per kilogram can potentially save tens of thousands of dollars per year for each generator. “Fuel cost is only part of the total economic picture,” Pratt said.